Sail aboard the Santa Cruz II with your family and discover every nature lover's dream come to life on the Galápagos Islands. This trip was the perfect combination of knowledgeable guides and lecturers, small group size, wonderful ship, and the most spectacular destination imaginable. 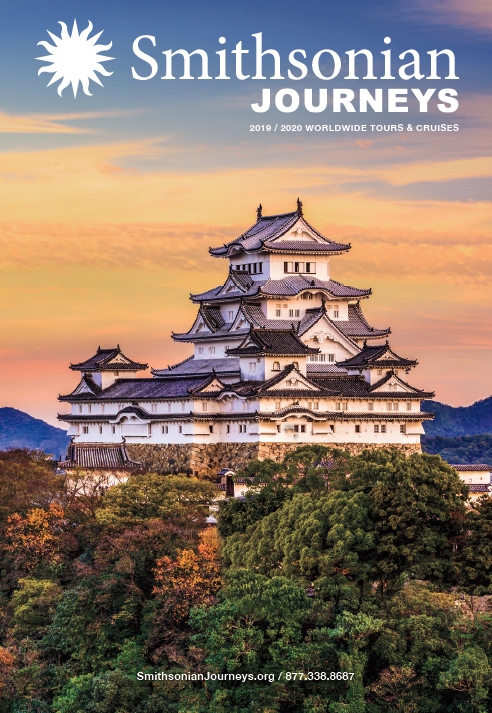 Save $1000 per person when you book by June 22, 2019! Give your family an adventure that will provide memories to last a lifetime. With your family, learn about Darwin, geology, and unique wildlife—and enjoy snorkeling, swimming, and nature walks—as you visit six of the Galápagos Islands. Unique Wildlife: Watch the antics of Blue-footed Boobies and observe the beauty of Nazca Boobies, flamingos, and Frigate birds. Get up close to sea lions, seals, Sally Lightfoot crabs, iguana, penguins, and giant land tortoises in their native habitat. Family Adventure: Cruise roundtrip from Baltra Island to San Cristobal, where you'll encounter sea lion colonies and dozens of bird species and reptiles. See prickly pear cacti and scarlet succulents during a nature walk on Santa Fé. At the Charles Darwin Research Station on Santa Cruz Island, you'll learn about efforts to protect rare giant tortoises, plus go for a nature walk or kayak in the clear blue waters of Tortuga Bay. Then cruise to Española Island—the southernmost and one of the oldest islands—where you'll see the famous Punta Suarez blowhole spray water nearly 100 feet high. And on North Seymour, swim, snorkel, or sea kayak off Gardner Bay's picturesque white coral beach and watch Blue-footed Boobie dive into the ocean for prey. The Santa Cruz II: Sail for six nights aboard our newly refurbished ship, which is outfitted with a fleet of Zodiacs and snorkeling gear. Our vessel is the ideal size for an expedition to the Galápagos—large enough to provide a choice of excursions but also offering an intimate experience. See more information about this ship on the Tour Details page. Each voyage will also host other leading cultural and educational institutions, which will add to the excitement and energy of the experience. Scientific Adventure: Discover Darwin’s living laboratory as your naturalist guides you in examining the underwater life in tidal pools and then analyzing the captured imagery on board the ship. Snorkeling Introduction: Prepare for safe snorkeling opportunities and natural history lessons in the fantastic waters surrounding the Galápagos Islands. Behind-the-Scenes Tour: Join the Captain on the bridge of the Santa Cruz II and learn how the navigation systems are used to pilot the ship. Sailors’ Astronomy: Engage with naturalists on deck for stargazing and learn how mariners plotted their course by the stars (weather permitting). Shipboard Cooking: Enjoy hands-on cooking with the ship’s chef. Galápagos Islands Guidebook: Explorers orientation upon arrival. Fly to Guayaquil, once a favored haven for 17th- and 18th-century English and Dutch buccaneers, and check into the hotel. 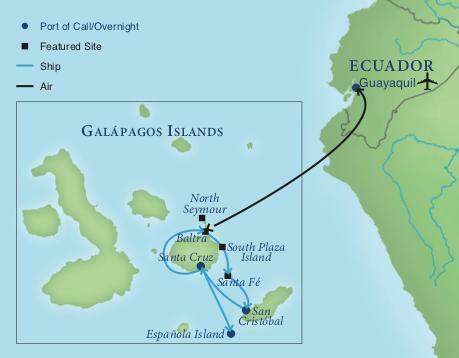 Please note that both the itinerary and cruise pattern are dependent on weather, sea conditions and Galápagos National Park Service regulations. In the midst of an abundant deciduous forest on San Cristóbal Island, visit a conservation and breeding center for endangered giant tortoises and see these amazing creatures up close in their natural habitat. Keep an eye out for dozens of bird species and two endemic species, the San Cristóbal mockingbird and lava lizard! Pristine white beaches, prickly pear cacti, droves of sea lions and prehistoric‑looking endemic iguanas make Santa Fe Island an essential stop for explorers of all ages! Enjoy snorkeling and swimming, glass-bottom boat rides or even kayaking in the lagoon’s crystal clear waters. Visit the Charles Darwin Research Station to learn more about efforts to protect the island’s rare giant tortoises. Continue to Santa Cruz’s cool, lush highlands for lunch amid mist‑covered forests. This morning, visit Punta Suarez on Española Island for a look at the unique wildlife during a nature walk guided by your expert naturalists. This island is known for its unique sea bird colonies, including the Galápagos albatross, Nazca boobies, blue‑footed boobies and swallow-tailed gulls. Watch the geyser-like spray of the famous Punta Suarez blow‑hole, and see the island’s red‑and‑green marine iguanas up close. Visit Eden Islet off the coast of Santa Cruz Island for more encounters with the incredible Galápagos wildlife. From a Zodiac, watch as blue-footed boobies dive into the lagoon, frigate birds flit about and reef sharks glide smoothly along the ocean floor. Enjoy a walk through the natural wonders of North Seymour Island, with more chances to encounter blue-footed boobies, frigate birds, sea lions, swallow-tailed gulls and marine iguanas.